We’ve been planning and preparing since last July to find a time that works on six schedules, gather the materials, and get people from three states to northern Wisconsin. Then last week before they were to arrive, our dog got sick (don’t ask), the water heater died, the infestation of Asian lady beetles in my studio was so bad they blocked all the light from the back window, and the forecast was for rain all weekend. That would have rattled me if my guests were not so accommodating. 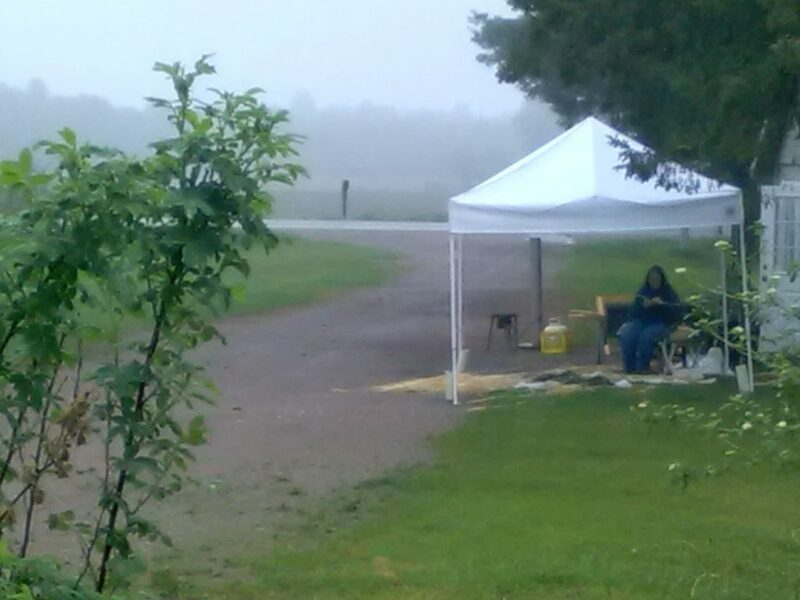 The dog got better, we filled the party perk for hot water for dishwashing, we put up my farmers market canopy to work outside during the day and stepped over the dead bugs to work in the studio after dark. Everyone brought food and made things work. It was lovely. 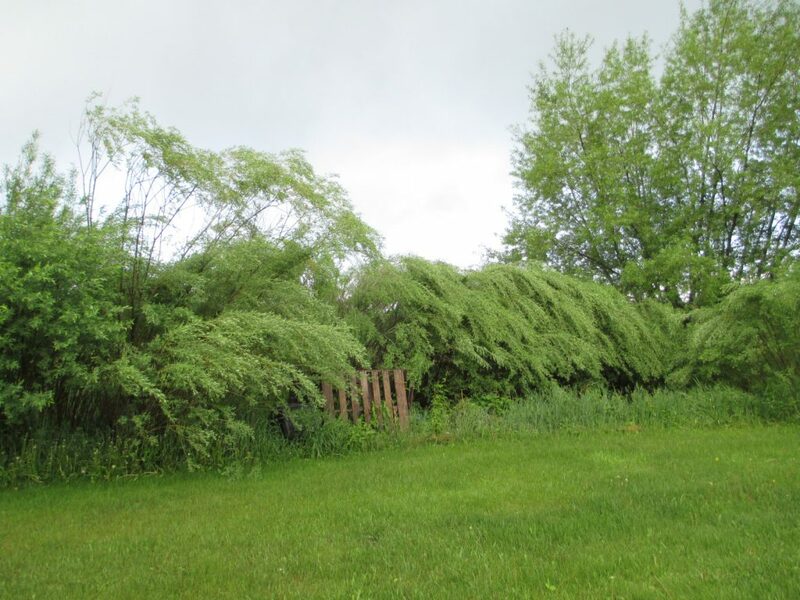 Our greater worry all along was that we wouldn’t find enough seasoned white willow for a group this large. Dawn had told me you have to wreck a lot of willow while learning to get the feel for the material. 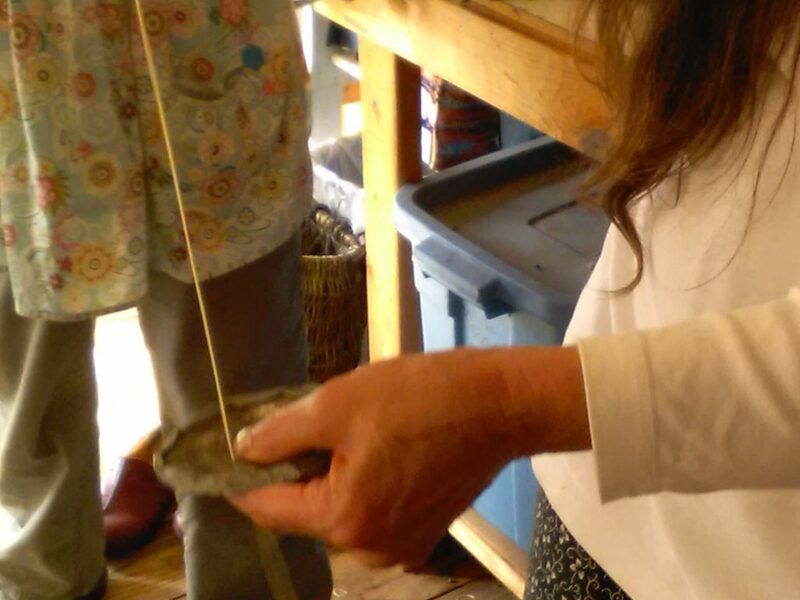 Some of us have started peeling our own willow, which is now seasoning for future skeining. The seasoning is important to help tighten the grain. 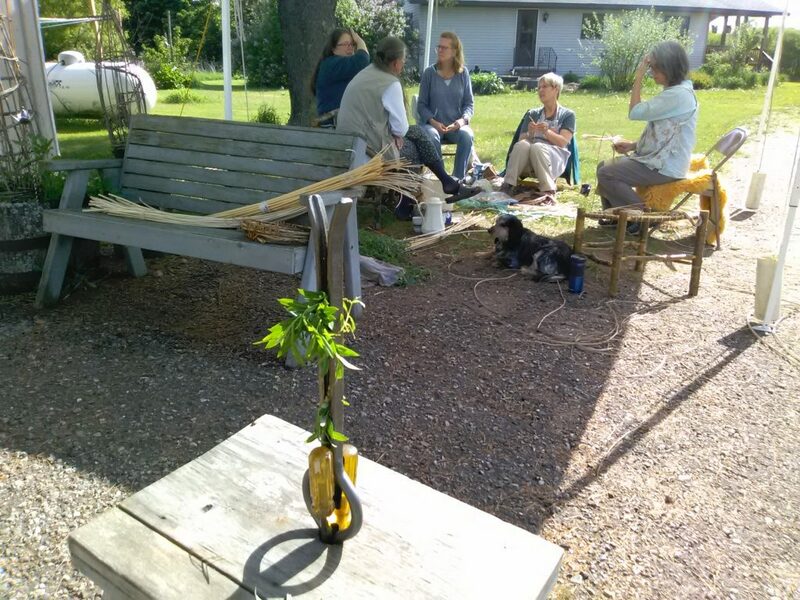 Last weekend would not have been possible if we hadn’t been able to get seasoned white willow from Katherine Lewis, Joanna Schanz, and Margaret Mattewson. They were all incredibly generous in parting with materials, and I think we cleaned them out. 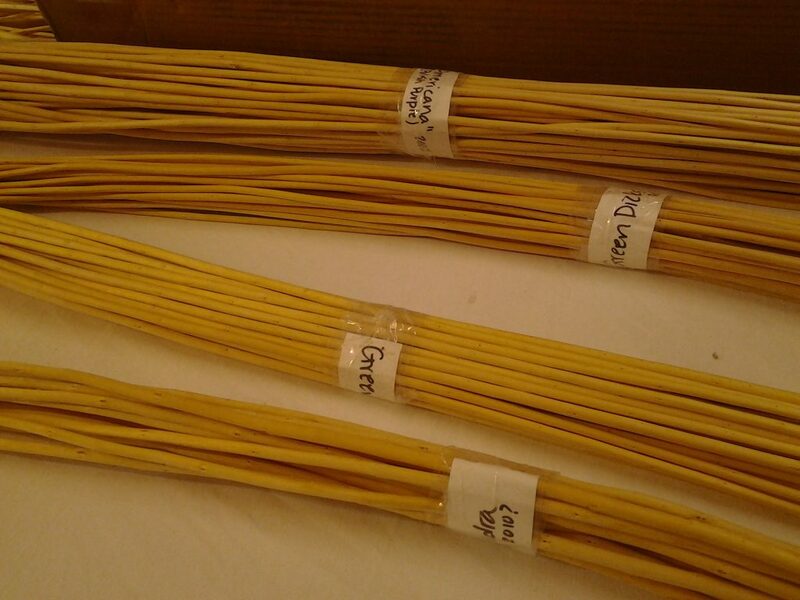 Dawn was hoping to identify which varieties of willow she would like to plant for skeining in the future. Katherine Lewis was particularly helpful there. 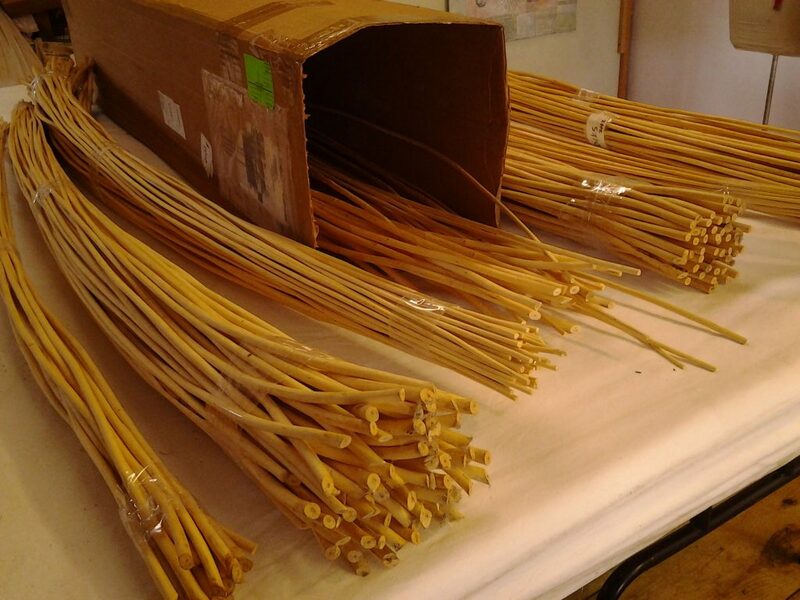 When we divided up the order, we sent Dawn all the bundles of willow that Katherine had labeled by variety. We figured the rest of us wouldn’t be able to appreciate nuances without a lot more experience (and we were right). Dawn ended up with salix purpurea “Green Dicks”, a variety called “Polish Purple”, and s. triandra. The rest of us divided the unknowns (about 3 pounds per person). We divided the material and had it cleaved into threes, soaked, mellowed and ready to wreck on Friday afternoon. 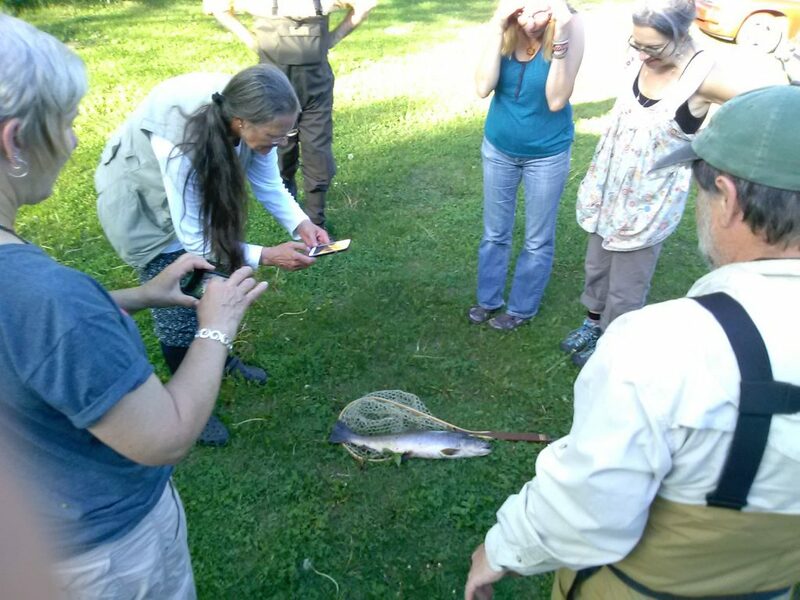 Dawn started by showing us how to take off backs — the triangle with the pith left when you split a rod into three pieces. 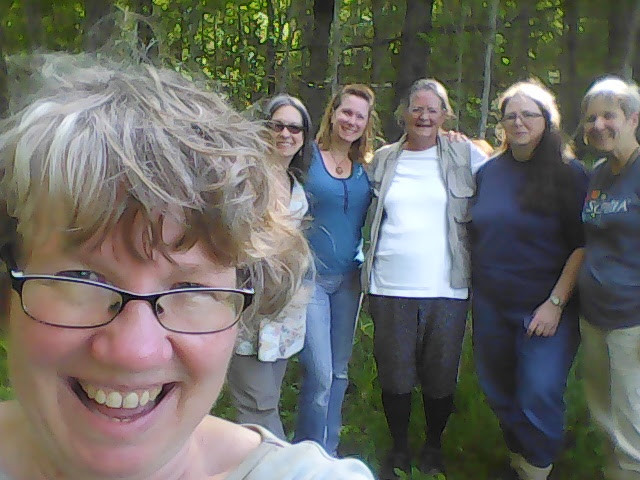 The six of us produced a generous pile of pithy bits (good for kindling) that gave meaning to the phrase “wrecking willow”. 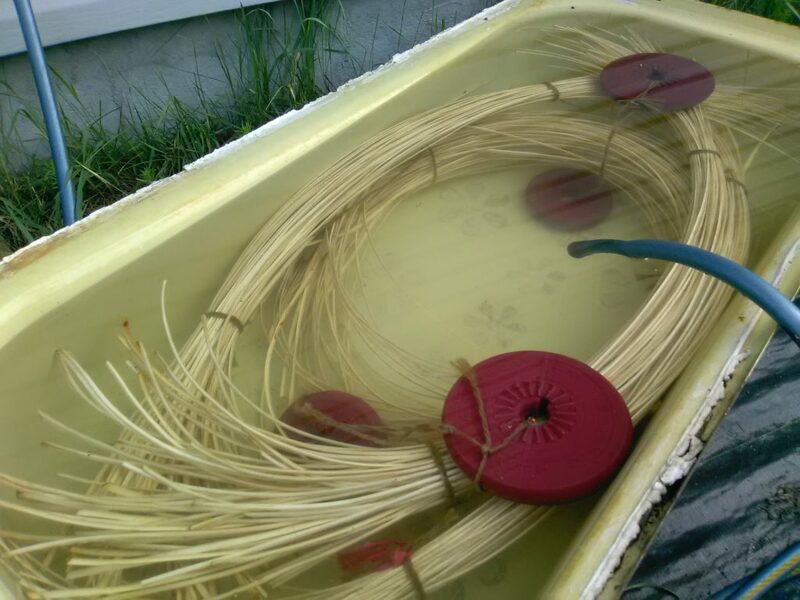 The outer pieces were coiled into bundles of 10 and dried overnight. Dawn told us this helps tighten the grain of the willow. The next day we soaked a bundle for 20 minutes or so, then took it out of the water to split again. The process of splitting is much like taking off the backs. But we were all trying to tread that fine line between consciously reading (and feeling) the grain and overthinking the process. Eventually, though, we all got to the point where we had managed a split, know what it should feel like, and know how to continue practicing on our own with our remaining bundles. But we went home with much more than material for practice. Dawn brought along an inspiring collection of samples to show us what can be made with willow skeins. And as we worked, she talked about how she works. I think the five of us are pretty practical, efficient and thoughtful about our workflow and materials management. 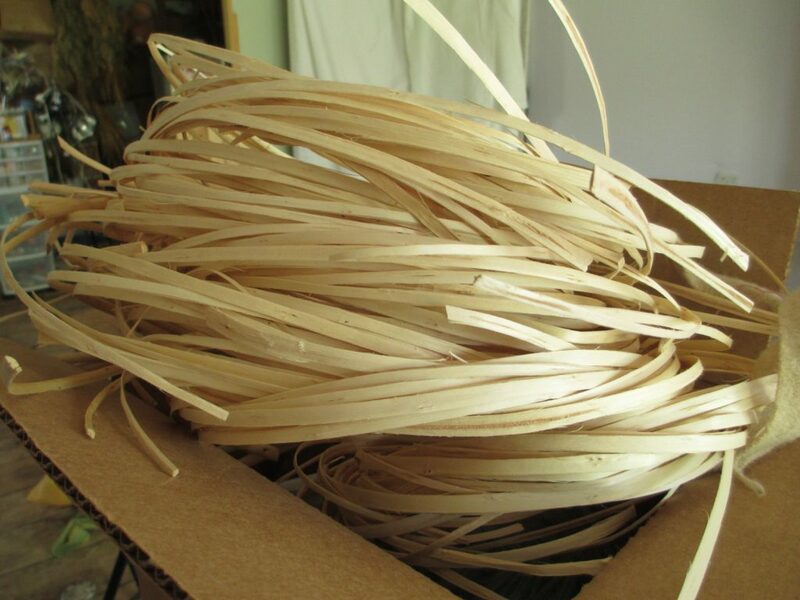 But five palms slapped into foreheads when Dawn explained why she coils materials into bundles of 10 that will fit into a bucket or canning kettle. 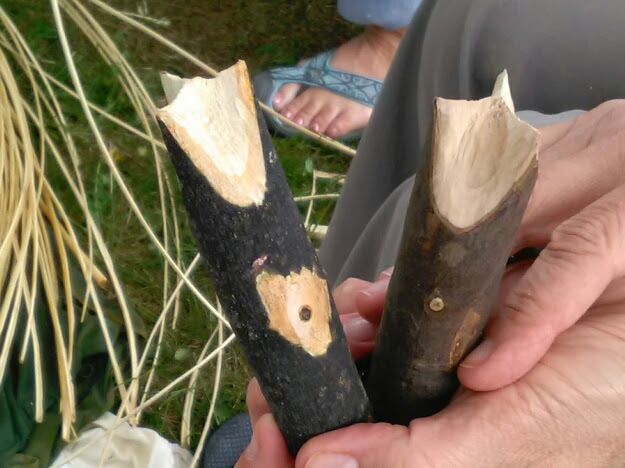 Dawn also brought some willow that had been cut dormant, split into threes with the bark on, and coiled to dry. 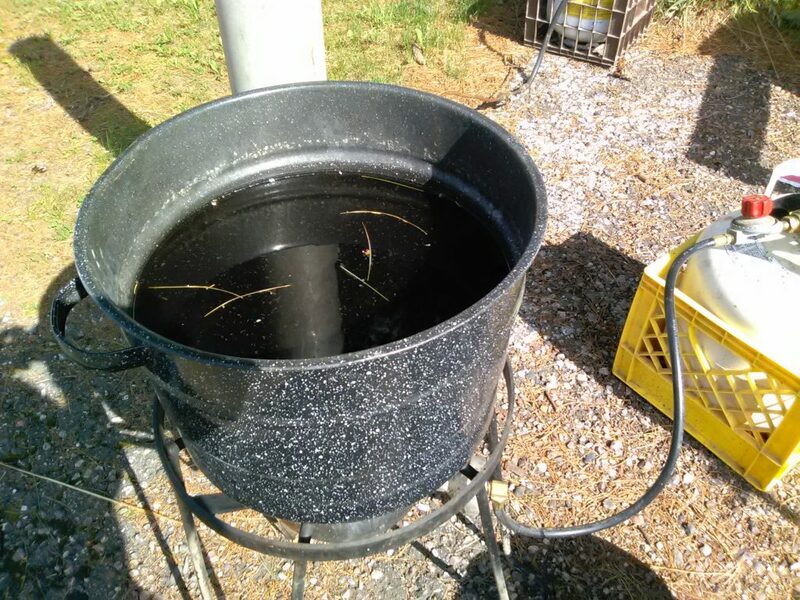 On Saturday, we threw a coil of that into the canner on the propane cooker and let it boil. That gave us all a chance to sample taking off the bark and taking off the backs. 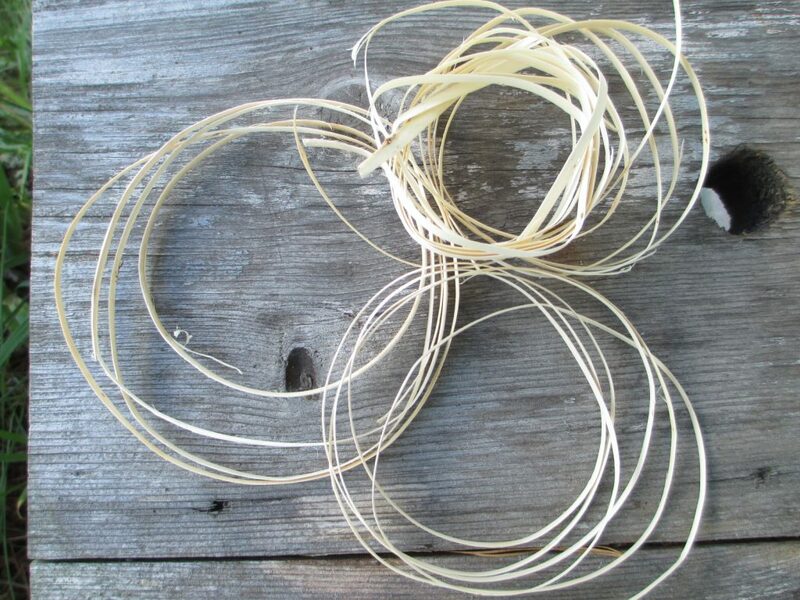 I fell in love with the boiled bark, which was leathery but supple and twisted like a dream into beautiful cordage. And I love the buff color of the skeins made from boiled willow. I just happen to have a good supply of overgrown s. purpurea “Green Dicks”. It’s what my family calls “snow fence”. But early next winter, I think the wrecking crew is going to get together to harvest it, split it into threes, coil in bundles of 10, and dry it for later boiling. 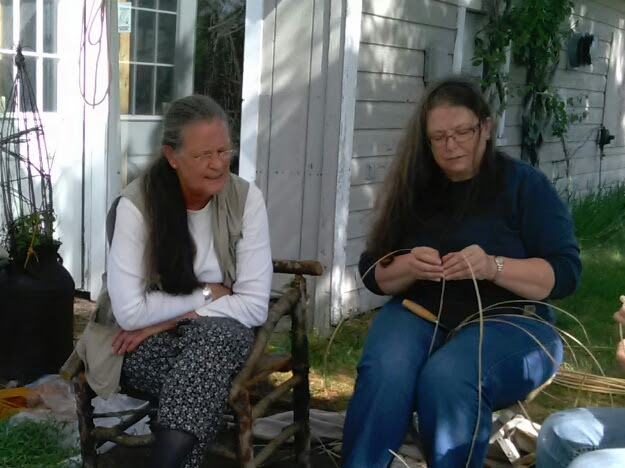 How can you not love a process that gives you a two-fer — bark for cordage plus skeins — and lets you do the bulk of the work in the winter! Spring in northern Wisconsin is always a race between snowmelt and budding. Early winter is perfect, at least for me. Dawn had a chance to do some sampling while we worked. She tried out Poppy’s willow brake (Poppy and I each bought the tool from Willow Glen Nursery). But the real excitement came when she sampled the s. triandra, which she said she would not have given a second look if it hadn’t been recommended (thank you, Teresa Gage). 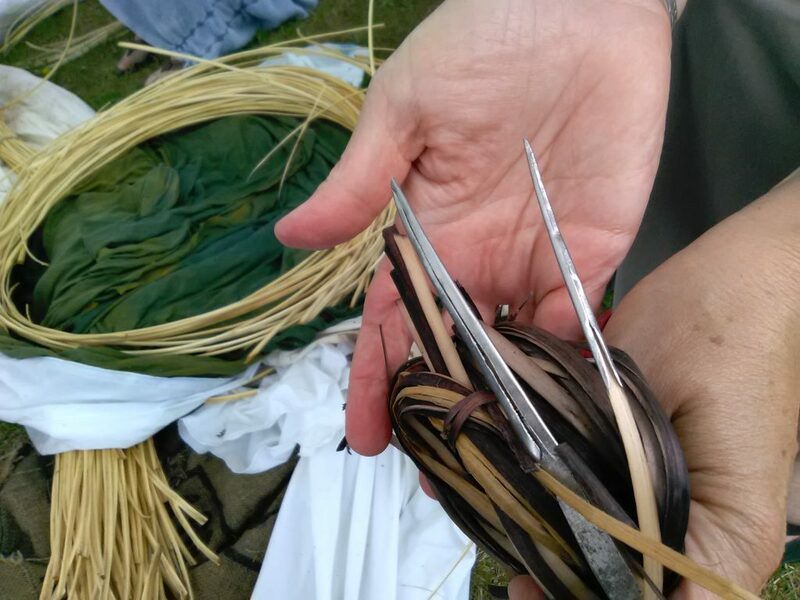 What Dawn found that our inexperience could not have fully appreciated is this: It may be a little harder to split triandra, but the “nodes” flatten out when you wrap it tightly (as in lashing a rim). And that variety has tremendous memory, and luster on both sides of the skein. None of us are growing triandra. Yet. But I expect that will change. By the way, Dunbar Gardens sells cuttings. There was a lot of sampling of cutters for trimming a willow skein once it has been split to the final thickness into a width that is consistent throughout the length of the thread. Dawn demonstrated trimming with a knife, and said she often trims with scissors (keeping the sharpener within reach). We also used a drawplate made from a tin can lid punched with holes in graduated sizes. And both Dawn and Beth brought Jerry Strippers so everyone could try them out. With pricey tools, it’s great to have an opportunity to try before you buy. 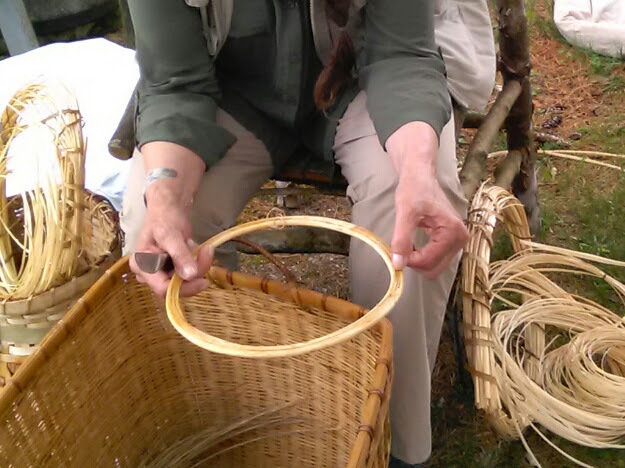 There was much admiration for Poppy’s hand-carved willow cleaves. The rest of us had egg-shaped hard maple cleaves purchased, on average, about 20 years ago. (My dog may have left a few toothmarks on Dawn’s.) I’ve had two people contact me since I wrote the post on cleaving asking where they can buy them. I haven’t found a source, but Beth is looking. You can contact her here. There were so many wonderful tips shared over the weekend that I can’t wait to get together with the wrecking crew again! But it wasn’t all work and no play. We did break long enough to take a walk before supper and admire the wildflowers. 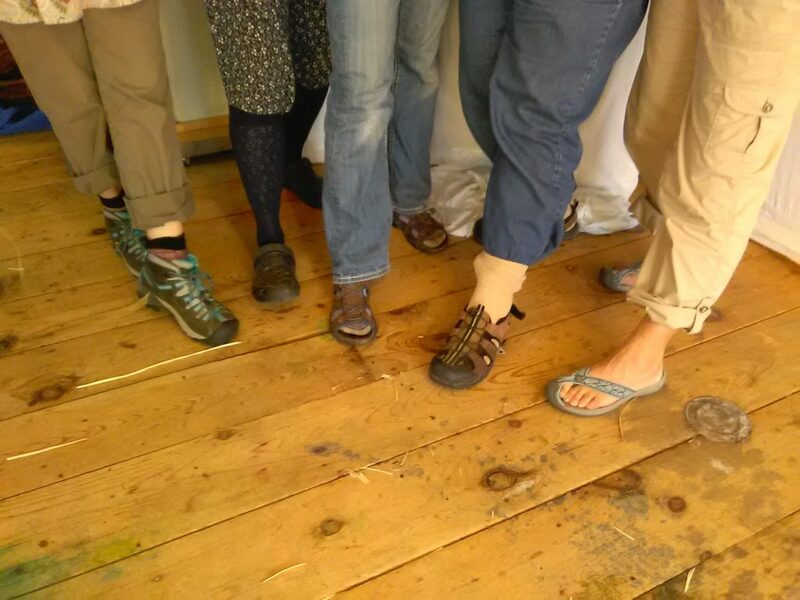 It’s tick season, so Dawn and Poppy demonstrated Northwoods fashion — tucking pant legs into socks. It’s also mayfly season, so Bill and Tony Amsler spend some time on the water fly fishing. They came home with a 24-inch brown trout and we had a Northwoods breakfast of grilled trout and scrambled eggs the next morning. We packed a lot into a short time, but the pace was relaxed and the company congenial. I have willow with the backs taken off to finish processing to help move what I learned out of my head and into muscle memory. And I can hardly wait for the next time the wrecking crew gets together! Great comentary on the wrecking party! Brilliance in inches . Tonight’s practice bundle went pretty well, but it’s still like spinning with a short draft when you want a long draw. We’ll get there! What a wonderful week-end you had. Always great to learn something new and even more so with friends who are just as enthusiastic as you are. Well said, Lene. Looking forward to seeing you again — soon! Looks like lots of fun and knowledge sharing sport I missed it! I think you were here in spirit, Paula — thanks for the sharing box! What a wonderful party! 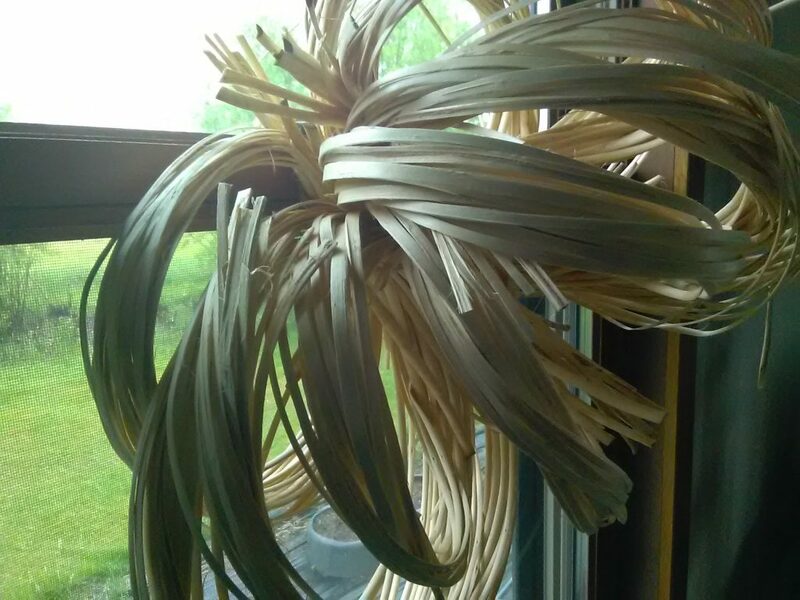 I’m a basket weaver in Michigan looking for this kind of weekend weaving. 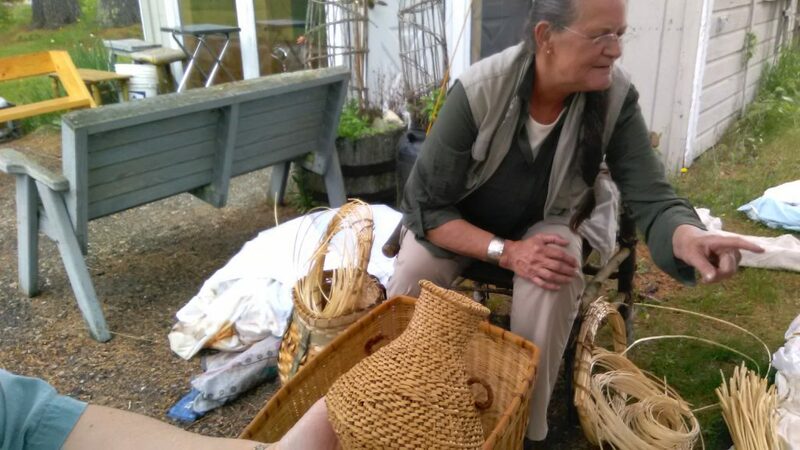 I’m also a gardener and would like to put in some willow for weaving. I’ll look up these varieties. Thanks for sharing. Sue, the Green Dicks is my go-to variety. The bunnies and deer prefer less bitter varieties, and it grows well even in my sandy soil. Good luck! Thanks, Donna, for the excellent description of skeining. 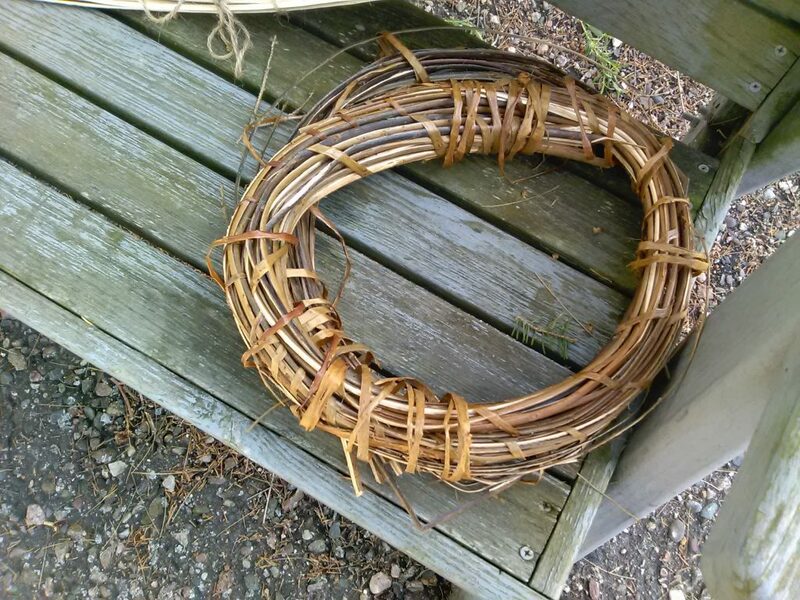 I now have a more profound appreciation for my antique skeined willow creels. What a process. You all are inspirational in your pursuit of excellence. Dawn is a very special soul who wants to assure such knowledge continues. So proud of all of you! Wreck on! Thank you so much, Paulette. 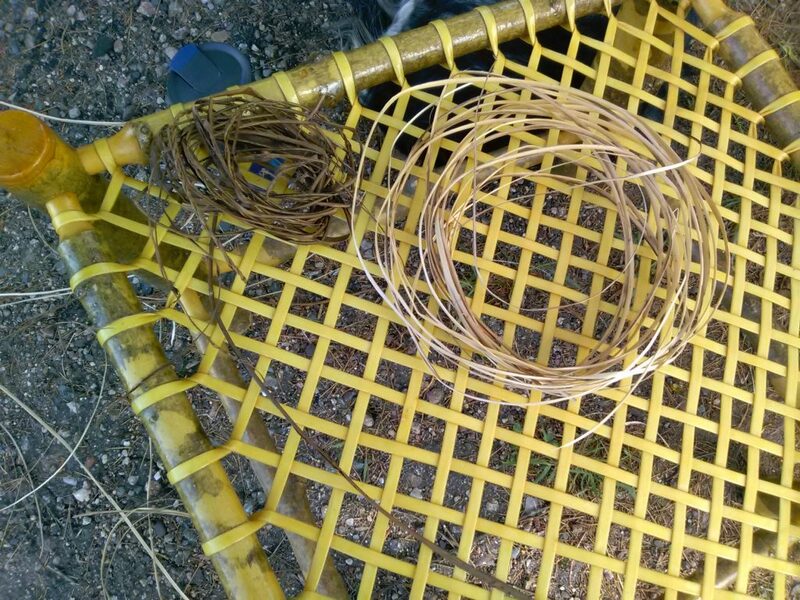 I’ve seen those skeined willow creels and wow — now when I look at the amount of material in them it boggles the mind. And you couldn’t be more right about what a special soul Dawn is! 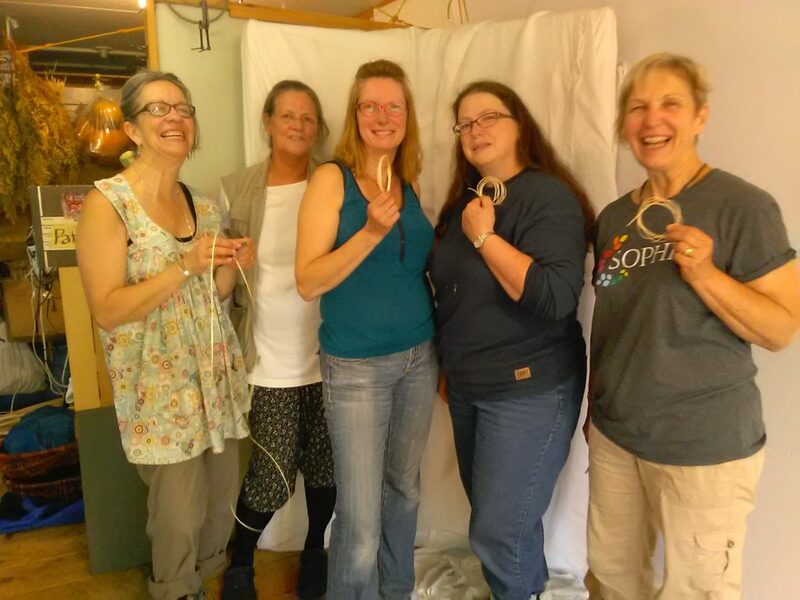 Thanks for the beautiful documentation of our magical weekend and fantastic learning experience Donna! I can’t wait to meet again! Dawn is a national treasure, she graces us with her knowledge and presence! I couldn’t have said it better, Karen!